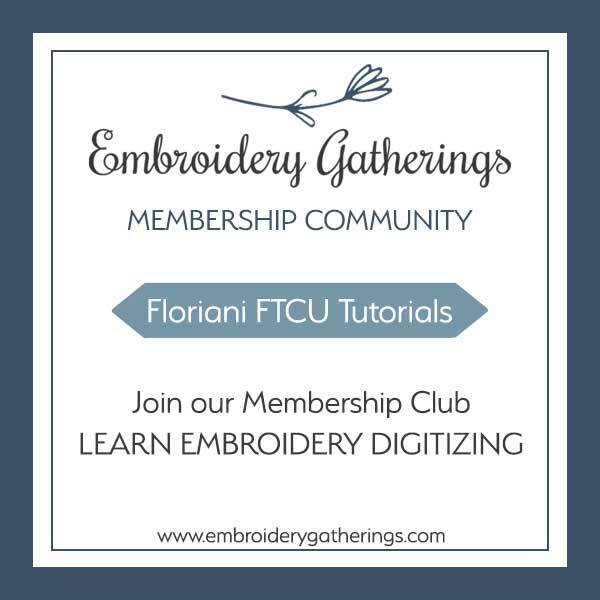 Floriani FTCU has two built-in options for digitizing – standard mode and advanced mode. I advise beginners to use the standard mode when they are learning to digitize. When you trace a design in standard mode, FTCU will add the default settings for the angle lines and the start and stop nodes. Here is a tutorial that will explain the differences between the two modes. These 2 settings are located in the PREFERENCES screen. First, I will explain how the STANDARD mode works for that tool. And then, change to the ADVANCED mode and show the difference in the settings. When in this mode, after tracing a segment with the RUN stitch tool, FTCU will automatically generate where the start and stop node is placed. left click on the RUN stitch tool in the top row. in the properties box, choose SINGLE RUN for the stitch type. When in this mode, after tracing a segment with the RUN stitch tool you are given the option to place the start and stop nodes. When in this mode, after tracing a segment with the FILL stitch tool, FTCU will automatically generate where the start and stop node is placed and the angle line also. 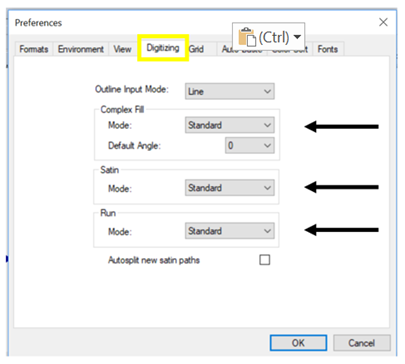 Note: You also have the option to change the default of the angle line. For this tutorial, just leave it at 0.
left click on the FILL stitch icon on the top tool bar. 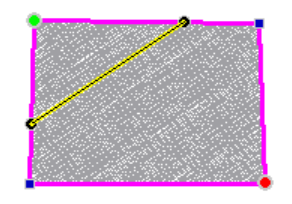 When in this mode, after tracing a shape with the FILL stitch tool you are given the option to place the ANGLE line and the START and STOP nodes. When in this mode, after tracing a segment with the SATIN stitch tool, you will still place the angle lines, then FTCU will automatically generate where the start and stop nodes are placed. left click on the SATIN stitch icon on the top tool bar. When in this mode, after tracing a shape with the SATIN stitch tool you are given the option to place the ANGLE line and the START and STOP nodes. Note: You may see a WARNING on your workspace that says you have created a satin stitch that is wider than the recommended width. Just ignore it, since you will not be stitching this satin stitch. Note: I left clicked and placed the GREEN node where the arrow is but it showed pink on my screen instead of green. I tried it several times and it still continued to show a pink color instead of GREEN. Not sure why the software is doing this, but wanted to inform you, in case yours does this as well. Just ignore it and move on to the next step. It did turn GREEN later after the next step. I hope this explanation helps you to understand the difference between the standard digitizing mode and the advanced digitizing mode. How do you know which one to choose when you are digitizing? It’s really a personal preference. I usually like to use the STANDARD mode and let the software generate the stops and starts. Then, I can edit them as needed. For beginners, I recommend using the STANDARD mode until you are comfortable with digitizing. It is a lot simpler to digitize in standard mode – less steps to have to think about as you are tracing the segments. 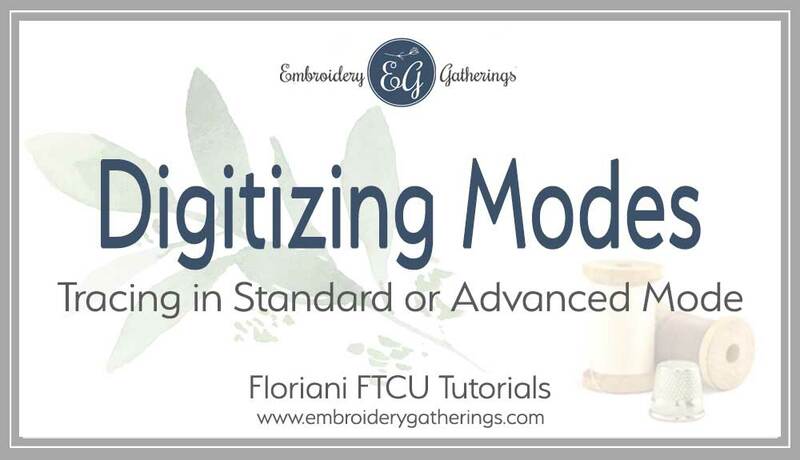 That’s why in the beginning of a lot of the Embroidery Gatherings tutorials, I tell you to adjust your settings to the standard mode. And besides, it is beneficial to let the FTCU software use it’s default settings to guide you! If you would like a PDF written copy of this tutorial, just fill out the form below and it will be emailed to you! Thank you for providing these free tutorials to enhance my beginner skills and clarify some of the questions I have about certain applications in this software. You’re welcome, Mary Ann. Glad you like the tutorials and find them helpful. You can get a copy of the PDF for this tutorial by filling out the email form at the end of the tutorial (right below my name). The PDF will then be sent to your email within a few minutes. You can do this for any of the tutorials and they will be emailed to you. It is all automated! Will you please email me the pdf of this presentation? Thank you. You can get a copy of the PDF for this tutorial by filling out the email form at the end of the tutorial. All the tutorials work that way. The PDF will then be sent to your email within a few minutes. Enjoy!